The demand in the global application development and deployment software market is projected to expand at an exceptional CAGR of 25.6% during the forecast period of 2017 to 2022. This market is chiefly driven by the sheer efficiency and integration benefits it offers, gaining traction in various application sectors such as BFSI, IT and telecommunications, and retail. 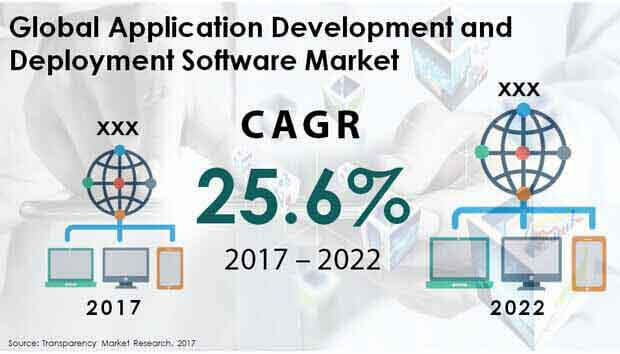 As far as revenue is concerned, the global application development and deployment software market is anticipated to be worth US$346,434.0 mn by 2022, significantly up from its evaluated worth of US$110,650.7 mn in 2017. Based on type, the global application development and deployment software market is segmented into structured data management software, application development software, application server middleware, data access, analysis, and delivery, integration and process automation middleware, and quality and life cycle tools. Among these, the segment of structured data management software accounted for 37.7% of the total demand, which was worth US$41,760.1 mn. During the forecast period of 2017 to 2022, this segment is anticipated to experience an above-average CAGR of 31.5%, reaching a valuation of US$164,196.1 mn by 2022. The structured data management software segment of the application development and deployment software market is producing a revenue of US$24,487 annually during the said forecast period. On the basis of vertical, the global application development and deployment software market has been bifurcated into IT and telecommunications, banking, financial services, and insurance (BFSI), energy and utilities, transportation and logistics, retail and consumer goods, manufacturing, and others. Based on deployment, the market has been categorized into cloud-based and on-premise. While on-premise currently accounts for the most prominent chunk of demand, cloud-based application development and deployment software are gaining popularity at a rapid rate and is expected to turn into a highly profitable category towards the end of the forecast period. Geographically, besides the country-wide market of Japan, the report takes stock of the potential of application development and deployment software market in the regions of North America, Europe, Latin America, Asia Pacific except Japan (APEJ), and the Middle East and Africa (MEA). In 2017, the North America application development and deployment market accounted for US$31,691.3 mn, which was substantially more than any other region. This region is projected to possess a revenue of US$96,213.1 mn by the end of 2022, exhibiting a CAGR of 28.9% during the forecast period of 2017 to 2022. Europe makes for the second most lucrative region for the vendors operating in the application development and deployment software market, promising a worth of US$73,973.4 mn by 2022, expanding at an above-average CAGR of 25.9% during the same forecast period. On the other hand, the region of Asia Pacific except Japan has been predicted to expand the demand at most prominent compound annual growth rate of 29.3%, with the estimated worth projected to reach US$74,959.7 mn by 2022. The global application development and deployment software market is moderately consolidated with a few players holding strong positions. Some of those prominent companies are: Microsoft Corp., IBM, Salesforce.com, Inc., Oracle Corp., Hewlett Packard Enterprise Company, SAP SE, Alphabet Inc., CA Technology Inc., Compuware Corp., and ServiceNow, Inc. However, newer players are creating a niche for themselves by catering to domestic requirements and are expected to eat out good chunk of shares from the market leaders. Product innovation and acquisitions of promising players are the two most common strategies of the established players. The market for application development and deployment software is expanding rapidly and this this report recognizes its changing dynamics. Developed by a group of professional market research analysts, this report has been prepared to serve as a credible business document for targeted audiences such as telecom service providers, government agencies, and cloud service providers. The report includes dedicated chapters on global application development and deployment software market dynamics, supply chain, cost structure, key participants by market presence, regional assessments, and competitive landscape. Transparency Market Research examines the global application development and deployment software market for the forecast period 2017-2022. The primary objective of the report is to identify opportunities in the market and present updates as well as insights pertaining to various segments of the global development and deployment software market. The report begins with an overview of the current scenario of the market for application development and deployment software across the globe, evaluating market performance in terms of revenue, followed by TMR’s analysis of key trends, drivers and restraints witnessed in the market. To compute the market size, in-depth secondary research is done. Data points such as regional splits and market split by software type, application verticals, and deployment have been assimilated to arrive at the market estimates. The report comprises the forecast of the global revenue generated by sales of application development and deployment software. TMR triangulates the data via different analysis based on supply side, demand side, as well as dynamics of application development and deployment software market. TMR not only conducts forecasts in terms of value, but also evaluates the market on the basis of essential parameters, such as Year-on-Year (Y-o-Y) growth. This helps providers to recognize the future opportunities as well predictability of the market. On the basis of software type, the global application development and deployment software market has been segmented into application development software, structured data management software, application server middleware, integration and process automation middleware, data access, analysis, and delivery, and quality and life cycle tools. On the basis of vertical, the global application development and deployment software market has been bifurcated into IT and telecommunications, banking, financial services, and insurance (BFSI), transportation and logistics, energy and utilities, retail and consumer goods, manufacturing, and others. Based on deployment, the market has been categorized into cloud-based and on-premise. For each of these segments, the TMR report provides revenue in terms of US Mn comparison by region, market share, and year-to-year comparison. Geographically, the report takes stock of the potential of application development and deployment software market in the regions of North America (The U.S. and Canada), Latin America (Mexico, Brazil, and Argentina), Europe (Germany, France, Spain, The U.K., Italy, and Nordic), Asia Pacific except Japan (China, India, Malaysia, Thailand, Australia, and Singapore), The Middle East and Africa (GCC countries, Nigeria, South Africa, and Israel), and in the country of Japan. For each of these countries, the report provides revenue comparison on the basis of type, vertical, and deployment. Hewlett Packard Enterprise Company, Microsoft Corp., IBM, Oracle Corp., Salesforce.com, Inc., SAP SE, Alphabet Inc., Compuware Corp., ServiceNow, Inc., and CA Technology Inc. are some of the key companies currently operating in the global application development and deployment software market.